Thanks to Mary on Facebook for sharing her (great!) find to the Tolkien Society Facebook page (member's only if you are having trouble loading), and giving permission to share this picture of the bookplate her 1943 1942 third impression Hobbit came with. 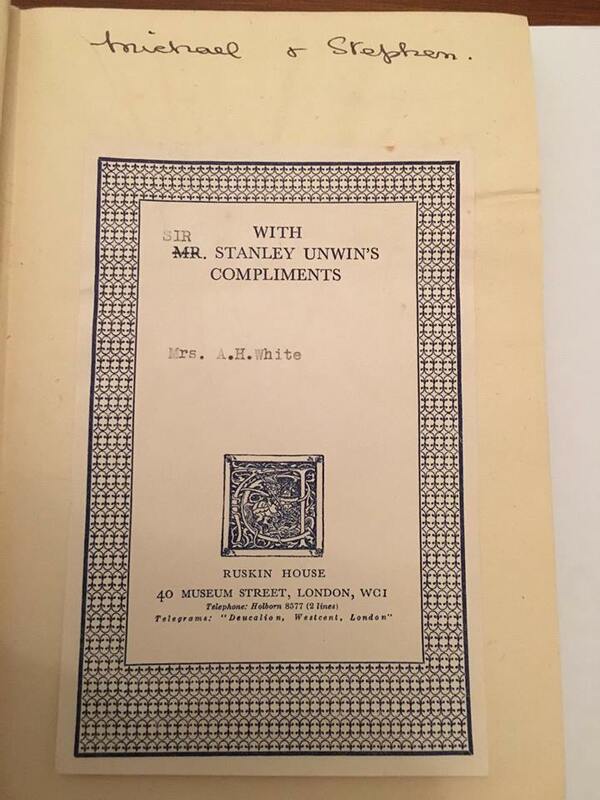 Does anyone know the year that Sir Stanley Unwin was knighted as I love the crossing out of Mr. on the bookplate? Ah! Just a typo on my post here, corrected! It would seem the bookplate was added at a later time to an older impression (at least four years). Not sure that it was, I think the 1942 edition was still on sale in 1946, so could be correct for that edition. The fourth impression was printed in July of 1946 according to Deagol's excellent webpage with the history of the Hobbit printings. Tolkien's letter is also July 1946, so it would seem that narrows down when this copy was given out! It was printed in 1946 but not bound until 1947, * The binding of 4,032 copies appears to have been charged by Key & Whiting in December 1947. The cause of the delay in binding is unknown. Binding over 4,000 copies at one time appears to have been unusual judging by other printings of The Hobbit. I saw that footnote - It does show it is possible that the fourth impression was not commercially available until late 1947, but I think it is also possible that they were binding all year long, and didn't issue the charge for the job until it was complete. Still, I think we all agree that the third impression was likely still in stock and available for Stanley to give a copy out in 1946. The binders tended to invoice at the end of the month. Key & Whiting were binding a lot of books for A&U and would have been submitting an invoice every month, so it seems odd that the binding of the whole 4th impression was charged at the same time. There are arguments both ways, but it seems reasonable to assume that the book was taken from current stock in 1946. Thanks for that additional info Deagol. I'm more leaning towards them binding all of them end of 1947 based on your report that they invoice every month (based on just this thin evidence). In any event, hope you all enjoyed the bookplate like I did.